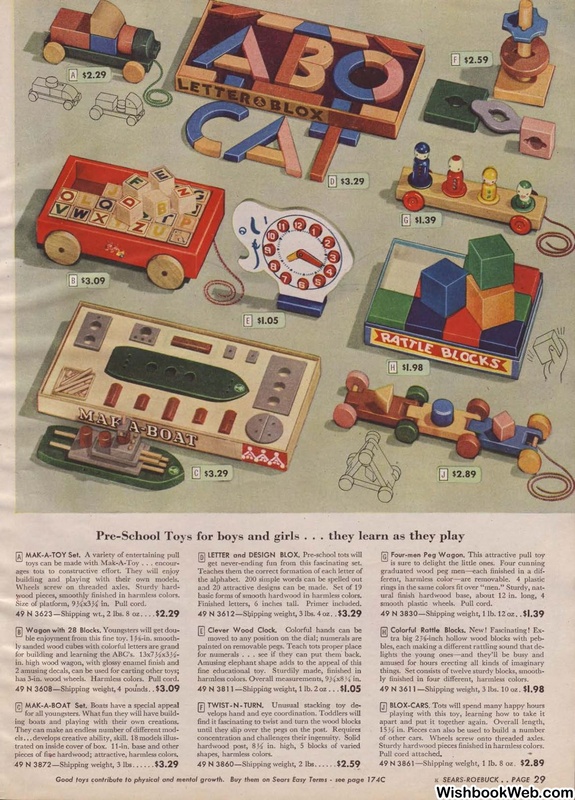 Pre-School Toys for boys and girls . building and playing with their own models. :,yood pieces, smoothly finished in harmless colors. Size of platform, 9Y.x3Y. in. Pull cord. N 3 623 - Shipping wt., 2 lbs. 8 oz .. . .
has 3-in. wood wheels. Harmless colors. Pull cord. N 3608-Shipping weight, 4 pou'nds ..
ing boats and playing with their own creations. pieces of fii;i.e hardwood; attractive, harmless colors. get never-ending fun from this fascinating set. basic forms of smooth hardwood in harmless colors. Finished letters, 6 inches tall. Primer included. N 3612-SQ.ipping weight, 3 lbs. 4 oz ..
for numerals . . . see if they can put them back. harrnless colors. Overall measurements, 9)-<!xSY. in. N 3860-Shipping weight, 2 lbs . .... .
smooth plastic wheels. Pull cord. N 3830-Shipping weight, 1lb. 12 oz ..
ly finished in four different, harmless colors. N 3611-Shipping weight, 3 lbs. 10 oz. of other cars. Wheels screw onto threaded axles. Sturdy hardwood pieces finished in harmless colors. N 3861 -Shipping weight, 1 lb. 8 oz.